Similar to the evening before and the Softball final, also the Baseball final at the Super 6 tournament in Hoofddorp, Netherlands had to be cancelled. Originally scheduled for 1.30pm on Sunday the final between the Netherlands and Italy had to be scratched due to the bad weather in the area. Based on the results of the preliminary round, where the Dutch team won all four games they played, the hosts were crowned inaugural winner of the Super 6. 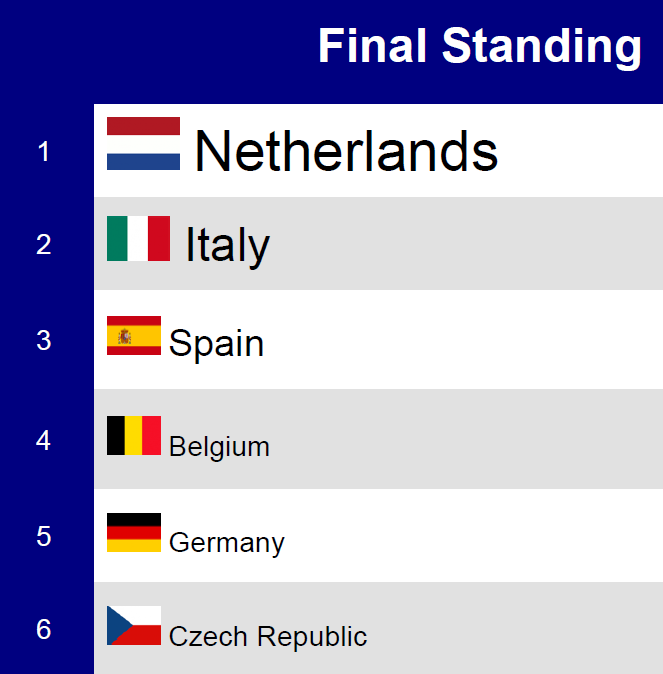 Italy finished in second, ahead of Spain, Belgium, Germany and the Czech Republic. Sicnarf Loopstock of the Netherlands was named MVP, Chris Collabello of Italy Best Batter and Daniel Alvarez of Spain Best Pitcher. Complete results and statistics are available through www.baseballstats.eu.